We are currently planting rows of bush beans, zucchini and corn as well as starting tomatoes from seed. We are using a recycled egg carton as our container with one seed being planted in each compartment. Remember to keep the soil moist throughout the entire germination process. 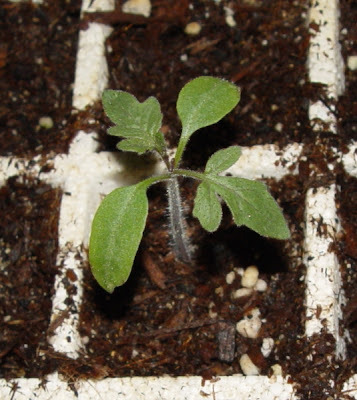 Once the seedling gets two sets of leaves like below we pot-up to a larger 3″ peat pot container. 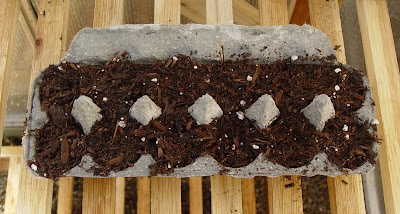 Peat pots can be planted directly in the ground. Once the seedlings are about 6-8 inches tall we can then transplant them to our garden. Remember to harden-off your seedlings before transplanting. Hardening-off is the process which introduces the seedlings to the outdoors a little at a time. We place the seedlings out side for a day, then bring them in at night. We do that for 2-3 days then allow them to stay out at night 2-3 nights. Once acclimated we can then transplant them to our garden. We’re a little more than halfway through the school year. According to my calculations we have 17 weeks remaining. We are still harvesting chard and kale on a weekly basis, however most of our other winter veggies have either all been harvested or gone to seed. We are now clearing those beds and amending them once again with organic compost for an all new planting of warm-weather, spring vegetables. Over the next couple of weeks we will be planting rows of beans, corn, squash and decorative sunflowers, as well as transplants of tomatoes, peppers, eggplants and cucumbers that were started indoors. For schools that are not accessible year-round I recommend growing cherry tomatoes, as the larger beefsteaks will not likely mature before school’s end.